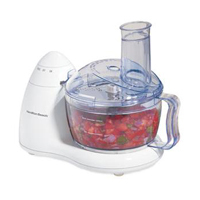 For a medium-size food processor at a low price of $31, this Hamilton Beach model holds up well against a lot of use. Able to chop, grind, and grate up to eight cups of food, it’s ideal for the average family who likes to save time in the kitchen. Its clean, modern design is visually appealing and doesn’t take up much space on the counter or in the cabinet. All the parts conveniently fit in the bowl for easy storage. We were relieved to find the controls extremely user-friendly, with a single dial that has a pulse option. All in all, this model fulfills its functions more than satisfactorily for a reasonable price.